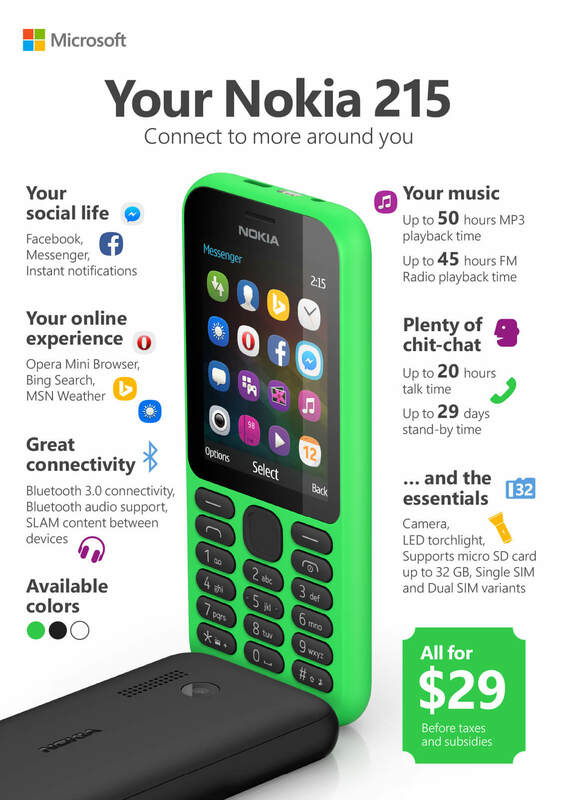 Today Microsoft announced a new feature phone, the Nokia 215. This Internet ready phone is a new design and aimed at connecting more people than ever before with the price of the device starting at only $29.00. For what the Nokia 215 offers, it is pretty impressive but I have to ask: At that price, why not get a Lumia 520 Windows Phone ? Enjoy online experiences via Opera Mini browser, Bing search, MSN Weather, Twitter and Facebook. Stay in touch with friends and family using Facebook and Messenger with instant notifications. Connect in new ways with SLAM, which enables content to be shared between devices and callers making hands-free calls using Bluetooth 3.0 and Bluetooth audio support for headsets. Delight in the fresh design, durable quality and outstanding battery life — all the features entry-level mobile phone owners have come to trust and love. Overall it is not bad at all and really allows someone who needs an Internet connected phone to get in at a rock-bottom price. But I still have to ask, why not a Lumia 520? While the Nokia 215 is aimed at the Middle East, Africa, Asia and Europe (don’t expect it to reach America), the Lumia 520 is abundantly available in those markets at a similar cost.